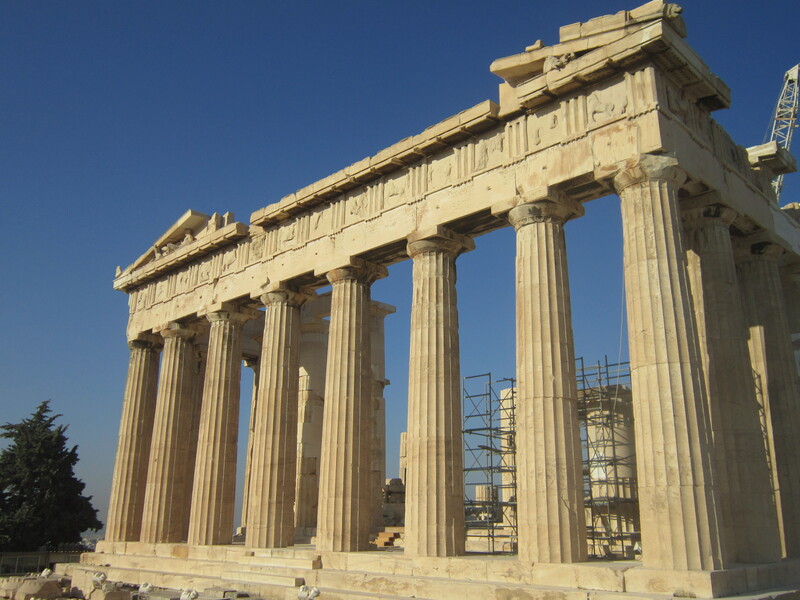 Continuing the tales of past travels, this post is about my trip in August/September 2013 to the wonderful city of Athens, Greece. I spent a week there, which was considered a long time by many others I met as people are so keen to visit the islands or are stopping by on a round Europe trip, but with the city’s amazing history I really wanted to take the time to explore it fully and have some fun doing it! It was my second time in Greece, the first was the isle of Kos in 2011 for a week’s holiday with my then girlfriend. This was actually my first real solo travel experience too, aka first time going to another country by myself! I flew in later on a Monday night, and navigated myself from the airport via the underground to my hostel, which was very central. It’s called Athens Studios, they have another site called Athens backpackers about 5 mins away. There was a sports bar next door so had a beer in there and watched football before heading to bed for an early night – much to do the next day! I woke up early to head to the Acropolis. My hostel was only 5 minutes away which was great. Even at 8am there were crowds, but I think a lot less than at later points in the day. It’s Athens most well-known landmark and for good reason, it really does tower over the city and it is astounding. On the walk up you pass by the Odeon of Herodes Atticus which is a theater I believe they still use now and then. Which is awesome to think about. On entering the top of the hill, the Acropolis itself, you then pass through the Propylaea, which is the gateway to the Acropolis. The sun was scorching at the top, at 8:30am I was dripping with sweat! I spent a good while walking around and seeing all the structures and ruins. The Parthenon is of the course the most famous building, and although there was construction work (clearly needed to stop it collapsing!) it didn’t spoil its magnificence! The other immensely cool structure at the top of the hill that sticks in my mind is the Temple Of Athena which was situation opposite the Parthenon. There are plenty of other ruins at the top as well, plus spectacular views of the city (great views are found in many places in Athens as I discovered!). Heading back down from the Acropolis, I checked out the various ruins on the mountain side as I head down to the Theatre of Dionysus. Amazing to think that 3000 years ago there plays being performed here! The Theatre could sit thousands, I imagine the backdrop of the Parthenon et al would have made for many a great evening. Next stop was to climb the Areopagus, which is this cool ancient rock nearby to the Acropolis. 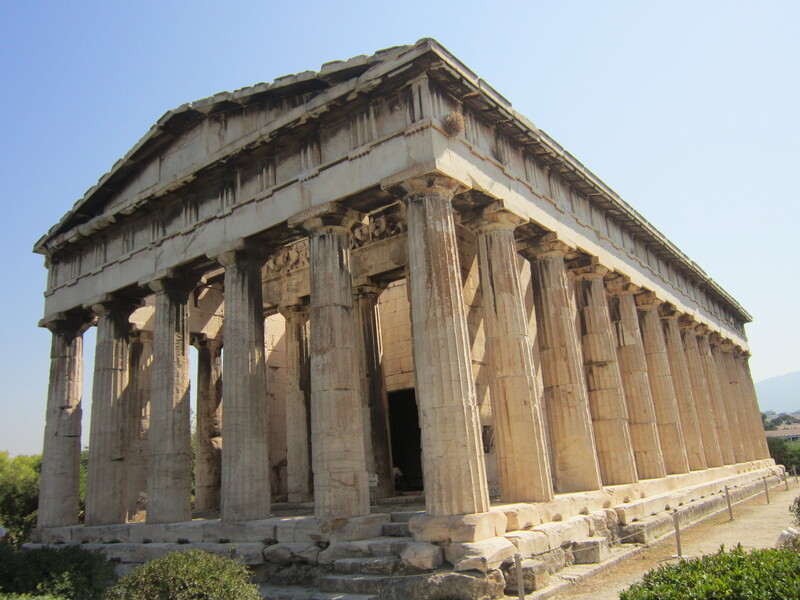 Then to explore the Ancient Agora which includes the very epic Temple of Hephaestus, which was constructed between 449 BCE and 415 BCE. 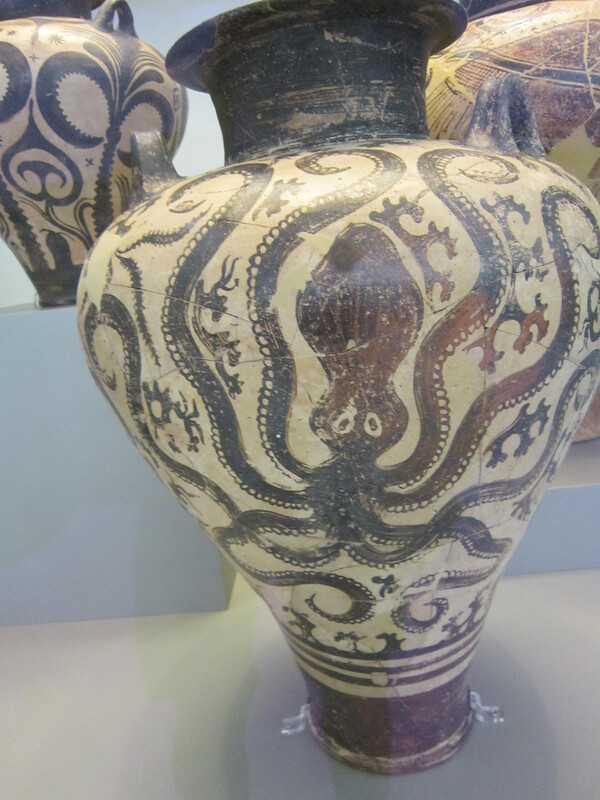 There is also a museum in the Ancient Agora that has some great art and pottery in particular. Just for reference the literal meaning of the word ‘agora’ is “gathering place” or “assembly” and there are various buildings and ruins dotted around. After that I went to the Acroplis museum. It was a pretty packed morning! The museum was cool, lots of information on life back then and on the Greek gods etc, though I was pretty tired out by then so didn’t absorb as much as I should have. After a rest at the hostel, I went and climbed Philopappos Hill which gave me some amazing views of the city, and of the Acropolis in particular. As well as the Philopappos Monument the hill has a nice natural feel to it, there are plenty of tree’s and birds and when I was up there it was pretty quiet. On the way up I passed a cave which was apparently the ‘prison of Socrates’. In ancient times the hill was known as the hill of muses. On the path down I explored the Pnyx, a hill which is fundamental in the establishment of democracy as this is where Athenians hosted popular assemblies, as early as 507 BCE. Pretty special to stand there and think 2500 years ago people were there laying the foundations for Western Democracy!. There’s an observatory nearby as well, though you couldn’t go in. In the evening I went to dinner with 2 of my room mates, and then we met one of the locals they had befriended and headed for a drinks, which included cocktails on a rooftop bar overlooking the Acropolis which was pretty awesome. A very successful day! Wednesday I headed to Syntagma Square to see the Parliament building, including the Greek Tomb Of The Unknown Solider, and watched the 12pm changing of the guards. The building was very impressive, apparently it used be a royal palace. The square has also the scene of protests in relation to Greece’s recent financial woes. 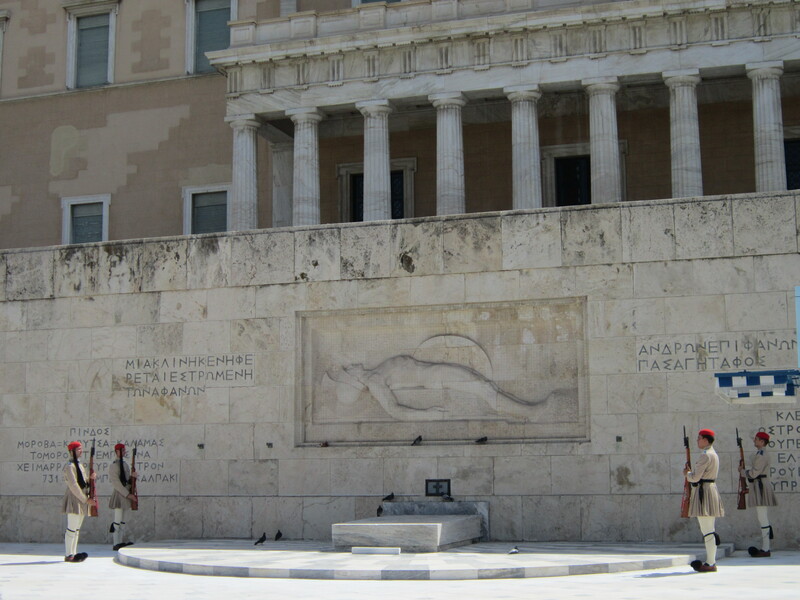 Tomb Of the Unknown Solider, Greek Parliament. Then I chilled out for a while in the National Gardens behind the Parliament. They are quite relaxed, worth checking out. There was a turtle pond and some nice flora, as well as the standard pond. There was a military barracks as well so a few soldiers dotted about. 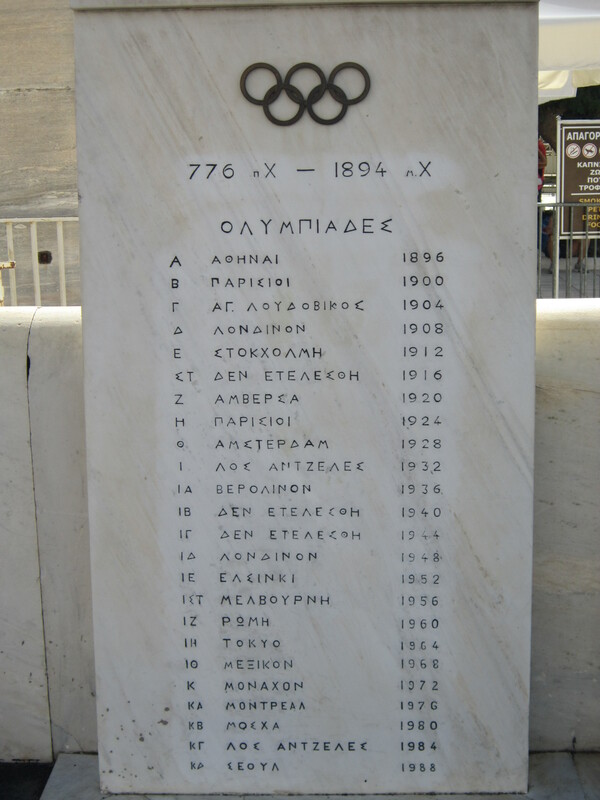 Following that I went to visit the Panathenaic stadium, which hosted the first modern Olympic games in 1896. 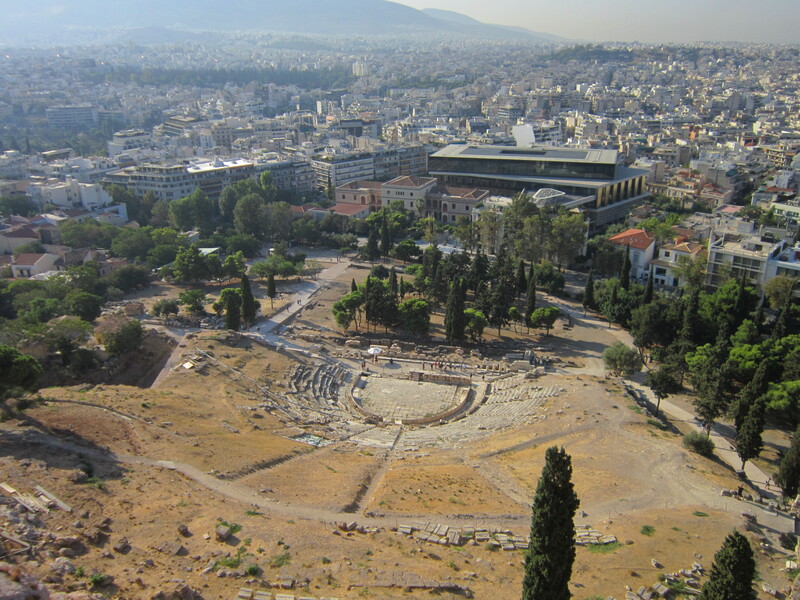 It’s built on an ancient site the Greeks used to use for athletic games (Panathenaic Games). It still hosts some events today, I walked around the stadium as allowed, including on the track which was very cool, and went in the little museum they have which you get to via one of the tunnels. That evening it was time to check out the rooftop bar at the hostels sister site. I met 2 Americans, Joe and Stro from Alaska. I don’t think I’d ever met anyone from Alaska before! They were cool guys and we got on really well, and we have kept in touch via social media since (facebook has its uses!). 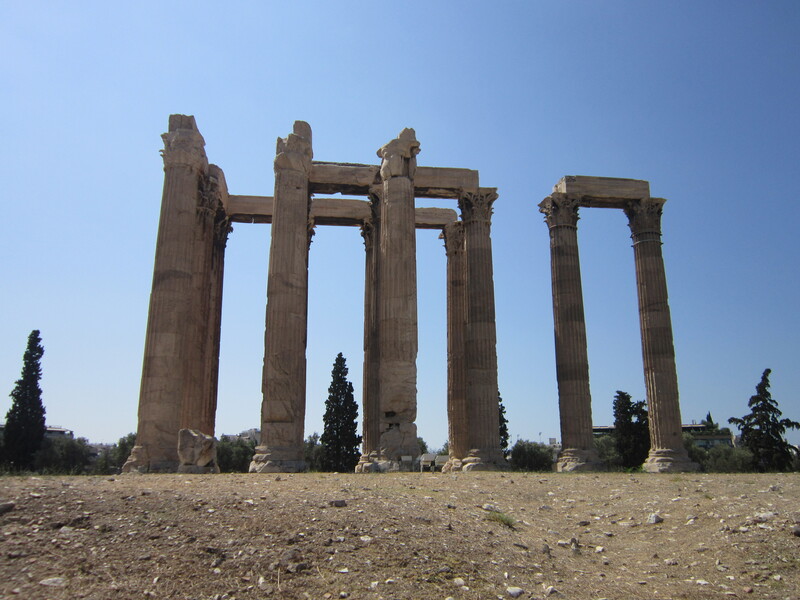 Thursday I went to see the Temple of Olympian Zeus. Very epic. 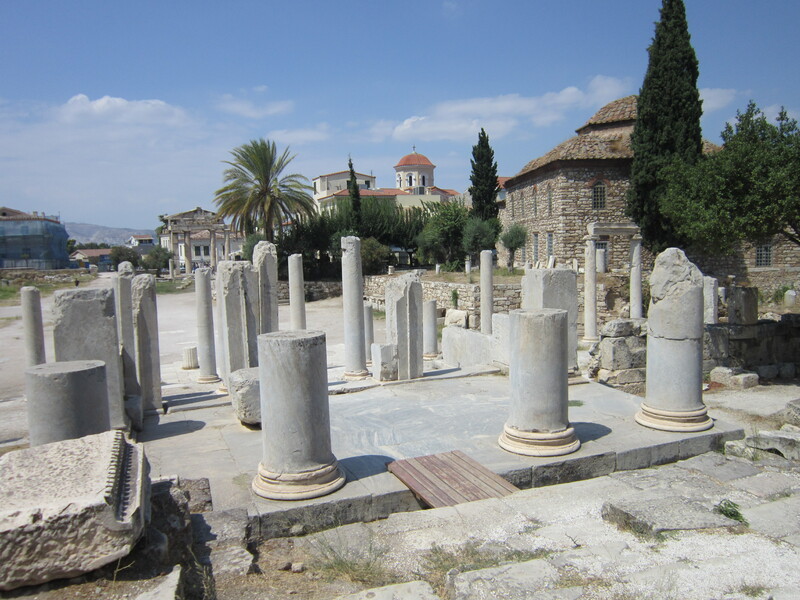 The columns are very high, I’d seen them from up on the Acropolis so cool to go see them up close. Surely must have been one of the most impressive temple’s this world has seen when it stood at full glory Nearby is Hadrian’s Arc, worth checking out. 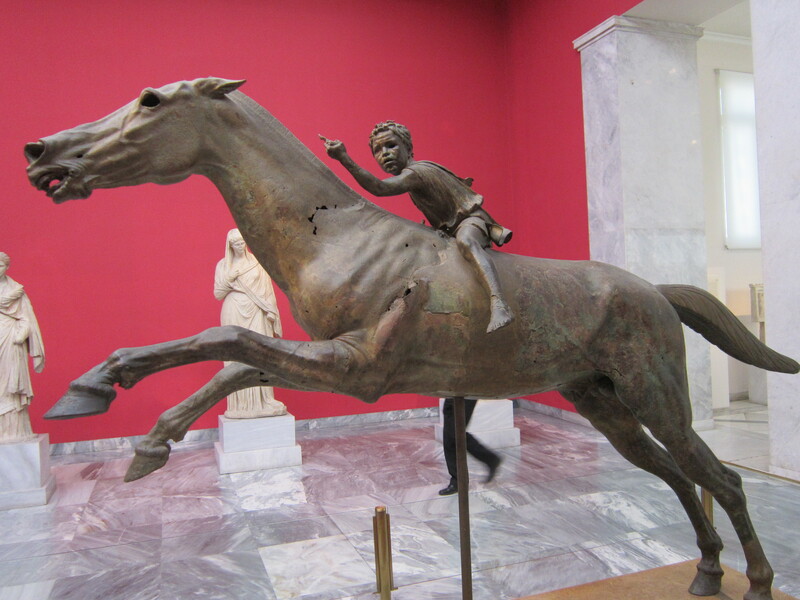 I then spent many hours in the National Archaeological Museum (Εθνικό Αρχαιολογικό Μουσείο) admiring the various displays. From Minoan figures to Mycenaean pottery, Egyptian art to Hellenistic statues, there was much to see and admire. Afterwards I walked up the nearby Strefi Hill for some great views of the city. In the evening me, Joe and Stro went out with my Argentinian room-mate Loriando. We found a fantastic local restaurant that was packed with people and did amazing Greek food. Being Vege I went for stuffed Tomatoes and Peppers with Greek Salad. It’s a shame I can’t remember the name of the place to recommend. It was sort of set across a street going up a hill, with tables on both sides of the path, very packed in and lots of chatter. After that we hit up an Irish bar, then the sports bar at the hostel, then a nearby salsa bar popular with the locals. Great night! Friday me, Joe and Stro headed to a beach on the outskirts of Athens, taking it easy and enjoying a drink whilst staring at the Aegean sea. In the evening we went to the hostel affiliated rooftop and sports bars before getting taxi out to the Gazi district, which is packed full of clubs. We found a roof top bar playing rock and metal so I was very happy, and proceeded to get pretty merry, chatting to a couple of the locals. Saturday I said farewell to Joe and Stro who went on with their journey (side note: Joe lives in the UK so I’ve met up with him once since then) and went to look around some of the Roman ruins in the city, which are pretty cool, as well as the market. The Roman Ruins were of the old Roman Forum and featured ‘The Tower Of The Winds’. I found a couple of heavy metal shops in the market so bonus. I then went and walked up Mount Lycabettus, which is a hill that sticks out from the Athens landscape and give some amazing views of the city and the Acropolis with the sea behind it in the distance. In the evening I pretty much repeated the journey of last night, going to the 2 hostel bars and then to Gazi with an Aussie girl I was hanging out with. We found another rock bar in Gazi as well, so victory on that part! Sunday was a chill out day for me, watching football in the sports bar with a few other gusts and locals and recovering from the past 2 nights partying. The day culminated with a meal out and then drinks with some hostel goers, we had a mixed group of 3 guys and 3 girls, between us a Brit (me), an Aussie and a Peruvian (the other 2 guys), 2 French girls and a Moroccan girl. That kind of diversity is why I love staying in hostels so much! We stayed up to the early hours of the morning chatting away, a great way to end the trip as I had to fly back to the UK the next day. As I mentioned earlier, this trip was my first real solo travel experience, and I’m glad its one I made. Asides from a few jitters on my first day, where I briefly questioned my logic, I found it every enjoyable and decided that solo travel is something I can definitely get along with. It was only for a few days of course, but definitely left me feeling that longer solo travel is something I can do in the future. I think the advantage is that it lets you do what you want when you want, and I feel pretty confident making friends in hostels and bars so can hang out with people when in the mood to. Athens is really great, I think many people just pass by and see the Acropolis and not a lot else, but i think it’s worth spending some time there and seeing other sites and enjoying the evenings. Thanks Millie! I’d like to see some more of Greece one day, Rhodes has been on my list to visit for awhile in particular!